Authored by ngraham on Sep 25 2018, 2:27 AM. This patch removes Root from the default Places panel for new installations, because it's redundant; you can still get to / on your machine in one click using the appropriate disk entry on the bottom of the Places panel. The appropriate disk entry now has a unique icon to help you distinguish it from others (added in D16653). By removing it, we gain room to add something more useful such as a Recently Used item (see D7446) without making the Places panel show a vertical scrollbar with Dolphin's default size. Log in with a new user account or rm ~/.local/share/user-places.xbel and open Dolphin; notice that Root is not on the Places panel. Seeing "Root" written as such, also makes me think of /root, which makes no sense to have there. The odds of needing quick access to / via Dolphin are extremely rare, and there is already a link anyway. People are used to clicking the primary drive to get to root dir. Why are you changing the if (windows) code path above the elif? Because that's the windows equivalent of adding Root. I reasoned that if we don't want to show a Places panel entry for Root on Linux, then for similar reasons we wouldn't want to create Places panel entries for Windows disks when on Windows. 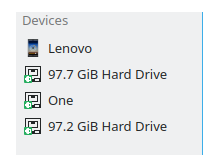 Don't disks show up in the Devices section on Windows like they do on Linux? Can't test, sorry. It isn't the same as adding root as it adds every drive quite deliberately. There is a solid windows device back end, but it needs asking someone. @bruns, do you know if Solid (and by extension, the Places panel) shows Windows disks when Dolphin is run on Windows? Side note: does anyone run Dolphin on Windows? Do we distribute it at all? Note this is _WIN32_WCE, i.e. dead code. WCE is no more supported by any half way recent Qt version. As @davidedmundson said/hinted, Solid uses https://docs.microsoft.com/en-us/windows/desktop/api/fileapi/nf-fileapi-getlogicaldrives to show the drives in the Devices section (same as done using e.g. UDisks2 on Linux), but this is independent of listing *pathes* (Root, Home) in the Places section. Thanks @bruns! So it looks like the Windows code can go after all. @davidedmundson? Imo this patch can go in as it is, but before that I would like to see a patch to have the disk with the root file system getting specially marked (icon, color or text) for the case that several block devices are mounted at the same time. Yes, that's one of the action items for T8349: Improve Places panel usability and presentation. Before we can do it, we first needed a better disk icon, which we now have thanks to @ndavis (see D15853: Change drive-harddisk to more adaptable style)! If we want to signify root disk status via the icon, we still need to figure out what to do about emblems, which currently obscure most of the icon for the default 16x16 size. I submitted a patch for that, but it's run into controversy: D15866: Reduce emblem size for very small icons to prevent obscuring too much of the icon. ngraham added a dependency: D16653: Use the new `drive-harddisk-root` icon for the root volume. ngraham added a dependent revision: D7446: [Places panel] Revamp the Recently Saved section. tcanabrava added a subscriber: tcanabrava. too many +1 to not be accepted. This blows up the places tests; will fix them in this patch. I strongly advise against this. This change goes against Plasma's brand identity and will provoke a strongly negative reaction from our core audiences. Plasma is strongly associated with powerful tools and high utility. Users also love having many options. Every time GNOME is criticized for "removing features," or not listening to feedback, we win big. Plasma is frequently praised for being the desktop environment that makes an effort to listen to its users. I asked for some preliminary feedback on a large Discord server for Linux users. I made sure to specify that the change only applied to the Places link, and Root would remain visible in Devices. 1 person was indifferent because they mostly used the terminal for most things outside of Home. 2 people suggested removing the Desktop link from Places instead of Root. Only the terminal user believed the Places link presented a safety risk to GUI users. Three people said there was no safety risk because Dolphin does not allow the editing of system files. Two users mentioned proprietary operating systems which provide a direct shortcut to the root directory. One user said this change would make him "mad," and one person asked if the team thought users were stupid. One user said it sounded "like something GNOME would do, not KDE." This was a quick 5 minute survey, but the feedback was very strong and even emotional. My personal opinion aligns with many of these comments, and I too find this change out of character for Plasma. I contribute to Promo and I am certainly not the most technical person here. I use this Places link many times a day. I consider the Devices link to be conceptually different, and it's much less convenient because my root partition is in the middle of my Devices list. I don't ever feel in danger of a misclick because Dolphin prevents any editing or deletion of system files. I do not understand why this change provokes any negative reactions. Right now, the Places panel has two items that both lead to the exact same location. This patch simply removes one of them by default, and adding it again if you want is a 10 second operation. No functionality is lost; / can still be accessed with a single click on an item in the Places panel by default. There will still be a "direct shortcut to the root directory". Are you referring to the mounted device under the Devices section? I'm unaware of how to get to the root directory in a single click using Places, if the existing link is removed. My question to users addressed the Devices point and I also provided the user feedback re: Devices. As you can see, opinion on the Devices link was mixed, while they were strongly in favor of the Places link. The person who said they wanted Root removed from Devices explained that the first time he used Plasma, he saw it mounted there and was afraid he had installed his system onto the wrong partition. Are you referring to the mounted device under the Devices section? I'm unaware of how to get to the root directory in a single click using Places, if the existing link is removed. This patch removed the red-circled item. The blue-circled item is still visible and still takes you to / when clicked on. Does that help? We are also thinking about improving the label given to the Root disk when it doesn't have a disk label. So instead of saying, "XXXX GiB Hard Drive", we could potentially make it say "Root drive" or "Root" or "XXXX GiB Hard Drive (Root)" or anything else, really. Okay, I was only referring to the Places section, not the entire panel. I do think changing the default label of Root's mounted device would prevent the confusion of the one user who wanted it removed from Devices. But that was only one of many criticisms of this change. I think the most emotional respondents consider this change to be condescending. Painting / as "too dangerous" for the typical user, even though Dolphin already has restrictions that make system damage through the Dolphin GUI impossible. Removing the quick and easy Places link and relying on users to locate Root among their mounted physical devices gives the impression that we don't / to be easily accessible through Dolphin at all, even if people can't do anything once they get there. I'm also worried this could make things more confusing for truly novice users, who may not realize there is a directory structure beyond Home at all. This can create many problems when trying to understand what the system is doing, or when troubleshooting. I do think changing the default label of Root's mounted device would prevent the confusion of the one user who wanted it removed from Devices. Okay great, I will submit a patch to improve that too. Who did that? I didn't. In fact, it's the UI itself that currently portrays Root as dangerous by displaying it with a red icon. Red == dangerous in our design language. If anything, this change makes browsing / less dangerous. because it's no longer represented by an icon with a red color. Removing the quick and easy Places link and relying on users to locate Root among their mounted physical devices gives the impression that we don't / to be easily accessible through Dolphin at all, even if people can't do anything once they get there. This argument doesn't make any sense to me. It's still there available via one click. I continue to fail to see how this change makes it not "easily accessible through Dolphin at all". You can literally get to / with a single click. Also, the Devices section only shows internal partitions so it's not like there will generally be 15 devices crowding the list. 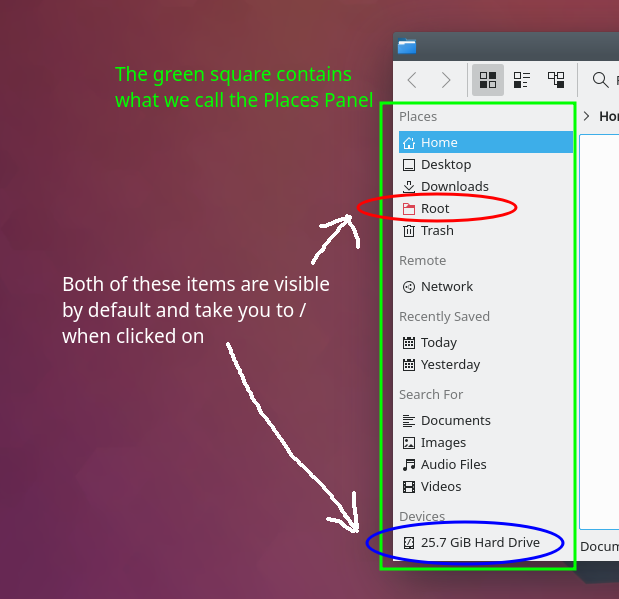 And the entire purpose of coming up with a new icon for the rood partition was to make it easy to pick out the root partition when there are multiple partitions in the list. That change was specifically requested as a precondition for doing this. "Truly novice users" don't have any desire to browse their computer's filesystem. The only people who are ever interested in that are technical experts, either actual or aspiring. I don't think this change will deter them in any way. I'm neutral on this change, but it can be argued that having Root next to all the other Places bookmarks makes it easier to reach. That seems rather weak though because it's easy to add back to the Places section and people who might not want it in Places are currently unable to remove it. It will have a new icon as Nate linked to earlier. The image in this patch is out of date since it was added before other changes were made; I need to update it and will do so later today.